The widely shared report detailed a conflict on Sept. 4 between the 27-year-old gold medalist from China and the doping control officers that visited his home in East China’s Zhejiang province. The incident ended with Sun, one of the most famous athletes in China, missing an out-of-competition blood test for illicit substances. In an interview with Caixin, Sun’s lawyer Zhang Qihuai did not acknowledge the report’s details about the encounter between his client and the testers, but Zhang defended his client by saying that the doping control officers had failed to properly identify themselves on more than one occasion when testing Sun. On Sept. 4, a doping control officer that had previously tested Sun once again arrived at the swimmer’s home without adequate proof of identification, Zhang said. FINA, the world swimming body, has ruled that the disputed sample collection session in September was “invalid and void” due to the testers’ breach of several rules because they failed to present the proper authorization documents and nursing license, Zhang said in a statement in response to The Sunday Times report. “Sun is entitled to reject any invalid doping test so as to protect the reputation and integrity of Chinese athletes,” Zhang said in an interview, according to China’s state-run Xinhua News Agency. On Jan. 3, FINA ruled in Sun’s favor after a 13-hour hearing of its Doping Panel by determining that Sun did not commit any anti-doping violation during the Sept. 4 test. The lawyer also emphasized that FINA had noted the case “shall not be made public,” which indicates the British newspaper’s report “has constituted an infringement on Mr. Sun Yang’s right of reputation and privacy.” Zhang requested the newspaper retract the report and immediately issue a public apology, according to the lawyer’s letter published by the Xinhua News Agency. The Chinese Swimming Association (CSA) backed the three-time Olympic champion on Sunday, saying Sun had done nothing wrong and did not violate anti-doping rules. “CSA ordered Sun Yang to fully cooperate with FINA and truly report every details of the affair,” according to its statement released Sunday. “Mr. 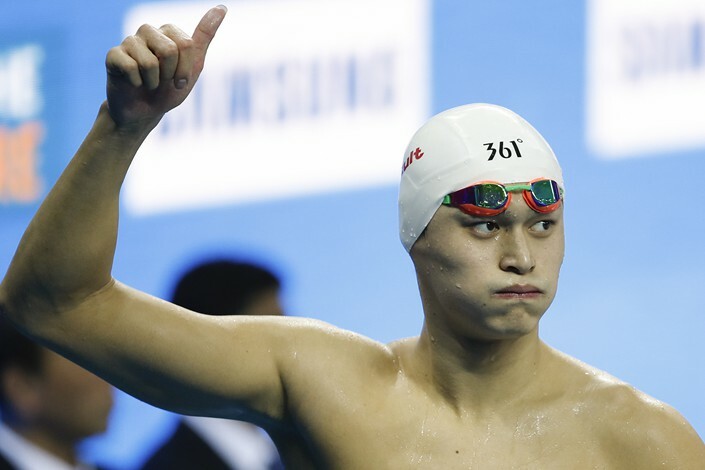 Sun Yang did not commit an anti-doping rule violation.” The swim star has won Olympic gold medals for 200-meter, 400-meter and 1,500-meter freestyle events and remains a world-record holder in the last event. Sun was embroiled in a controversy over doping earlier in his career. In May 2014, Chinese anti-doping regulators found that he had taken banned stimulant and suspended him from competing for three months. In his defense, Sun said he had accidentally taken the banned substance to ease discomfort in his heart.